The Outdoor ColorBright™ White LED strip lights comes as a 16' 5" or 8' reel of linear LED lights. The LED chips are mounted on a flexible strip of printed circuit board (PCB) with a strong adhesive backing and can be cut every few inches [1" (25.4mm) for 12V version and 2" (50.8mm) for 24V version]. A silicone cover protects the strip from splashes of water and foreign elements. Sometimes referred to as "LED tape lights," the flexible design of LED strips means the lights can be installed in basically any space you can imagine. The fact that the flexible PCB can be bent up to 90 degrees and cut every 3 or 6 LEDs makes it a very versatile and customizable solution for adding white lighting wherever you need it. The IP65 protection not only allows the lights to withstand jets of water, but also makes them extremely easy to clean. What are the top 4 comparing factors to look for before purchasing LED strip lights? 1. Make sure you know the requirements for your project, then when looking at options, compare lumen output, CCT, and CRI. 2. Compare LED strip size and number of chips on the reel. 3. Understand the wattage and voltage that the LED strip light uses. 4. Make sure that the products have verifiable quality. To read more details on these top considerations, click here. What is a 3528 SMD LED chip? 3528 SMD (Surface Mounted Diode) represents the size of the LED chips on the strip. A 3528 SMD chip measures at 3.5mm x 2.8mm. Click here for more information on LED chip sizes. The color of light can be quantified by referring to its color temperature. White light is measured in Kelvins (K). Most white lights fall in a spectrum between 1800K and 6200K. When passing below 3000K, the light will appear noticeably "warmer" or "softer". On the other end of the spectrum, the lights have a blue-ish tint and cooler tone when nearing 6500K. Which color temperature should I choose? What’s the difference between the ColorBright™ and the UltraBright™ Series? While all of our lights are fully dimmable, the ColorBright™ Whites Series is great for accent lighting, cove lighting, and under cabinet lighting, come in a variety of different colors with the addition to the same whites as the UltraBright Series. The ColorBright series also has a color changing series where you can control a single strip to create any color you wish. Our UltraBright™ Series offers a lot higher brightness strips and have more commercial and industrial uses. We offer a 5-year warranty on all of our LED strips to all of our clients. The warranty on power supplies ranges from 2 to 7 years which is model dependent. 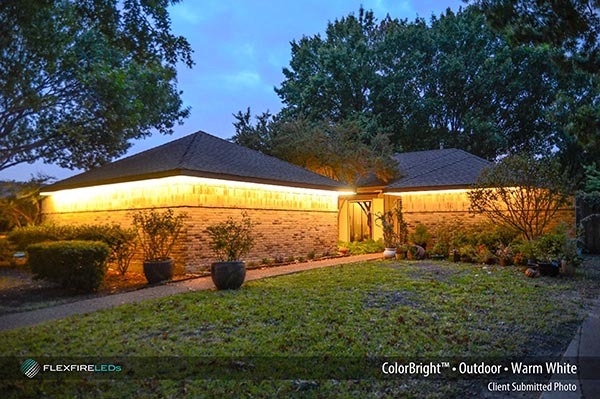 What are the recommendations on adhering outdoor-rated strip lights? All of our outdoor-rated lights come with mounting brackets. The strip also has a 3M adhesive on the back. We recommend using both for the most secure installation. They can also be installed within a mounting channel. What does IP mean? What is the difference between IP65 and IP68? This is a rating system that defines the ability of a product to be able to work in different environments. IP is an acronym "Ingress Protection". It is a measurement of the protection an item will have against solid objects (dust, sand, dirt, etc.) and liquids. An IP rating is comprised of 2 numbers. The first number refers to the protection against solid objects (dust, etc) and the second number refers to protection against liquids. Here is a complete article about IP ratings. Can I cut reels that are outdoor rated IP65? Yes. Be sure to reseal the strip light each time it’s cut to prevent water damage. A lot of clients like to use a liquid electrical tap. How flexible are these outdoor strips? The IP65 is flexible like a measuring tape. Because we use a soft silicone sleeve to make the strip water resistant, it is still very flexible. What is the lifespan of your strip lights? What do I need to turn on my lights? Which Power Supply do I need for my (x) feet of LEDs? The length of LED strip lights of your project will determine the size of the power supply you need. View our Power Supply chart to find the exact LED power supply you need. Wow these are bright! What do I do if I want to dim my LED strip lights? All LED strip lights are dimmable. The LED strips can be dimmed either through our dimmers [PWM dimming], or by a Lutron wall dimmer. 1. If you plan to dim your LED strips using a hardwired Lutron wall dimmer, you need a Zurik dimmable driver. This driver itself will be dimmed from the Lutron switch.